As we are in the height of yachting season AIG's Yacht Loss Prevention Services are a great way to help prevent your client from having a loss or at least lessening the damage. It includes safety awareness, crew hiring assistance, repair consultations and other services. For the larger yacht owners they offer greater services, such as thermographic evaluations, crew first aid training, onboard art collection management, and more. Fire on a boat is a great danger since unlike on land, leaving the building means going into the water, which isn't always safer such as in strong currents or during a storm. Even in a marina or close to shore boat fires are difficult to handle as this ship battery fire proves. AIG is so committed to minimizing fire loss they actually train fire departments near large marinas on the unique aspects of fighting a fire onboard. Speaking of season heights, we have just entered the height of the hurricane season (Aug-Oct) and AIG has that covered as well. But even well laid plans may not be enough. These sailing yacht owners could only watch as the tidal surge from Hurricane Sandy started knocking their boats over like dominoes, despite being on high ground and on stilts. That's when AIG's yacht coverage kicks in. 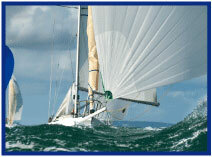 Yacht coverage is part of AIG's Private Client Program and is available to registered members in all states. Sail over to Big "I" Markets and click on Affluent Program - New Business to learn more! 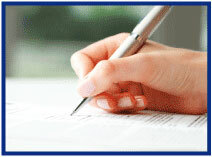 A recent trend among insurance companies is NOT to require a signed and dated application to bind coverage. Big "I" Professional Liability's risk management team is hosting a panel discussion that will tackle risks associated with this trend. Join us for a FREE 30-minute Big "I" member-exclusive webinar on August 17th at 2:00 EDT: To App, or Not to App? That is the Question. The phrase "Employee Theft" covers a lot of different aspects. Padding an expense account, forging a receipt, taking product, cash, or supplies are among the smaller types and may only occur a few times or even just once. Systemic theft include false vendors/customers, fake (or dead/retired) employees drawing a salary, material and/or large scale theft of cash and can go on over weeks, months, or years. One postal worker faked being on jury duty for months after he had been excused and only got caught because he tried the same scam when he was summoned again a few years later. Fidelity/Crime from Travelers covers employers for direct loss as well identity fraud reimbursement and reasonable claim expenses. 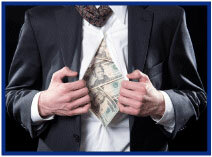 Fidelity Crime can be obtained singly or as part of a the Wrap+ for Executive Liability for Private Companies. You can pick and choose the coverages your client needs and leave off what they don't. In the future you can add new or drop old coverage as needed. Last week I was with most of your Big "I" state association executives at their annual meeting. There was much discussion of the future of automobile insurance and self-driving cars, automatic braking, telematics and the impact on the industry. At some point between a networking hike and jumping off a cliff into a lake (apparently risk aversion in insurance people is not a given) the idea struck me that a major reduction in automobile insurance premiums would impact some insurers more than others. I said, I would look up GEICO's largest automobile insurer state-by-state premiums. GEICO General Insurance Company is the largest personal auto writer in the Berkshire Hathaway fleet. It writes about 35% of the personal auto premiums of the GEICO insurers and, according to the Maryland Insurance Department in 2014, it was used to write preferred-risk individuals who were neither government employees nor military personnel. This helps explain for me why you see all those airplanes towing GEICO banners flying up and down the beaches in Florida. 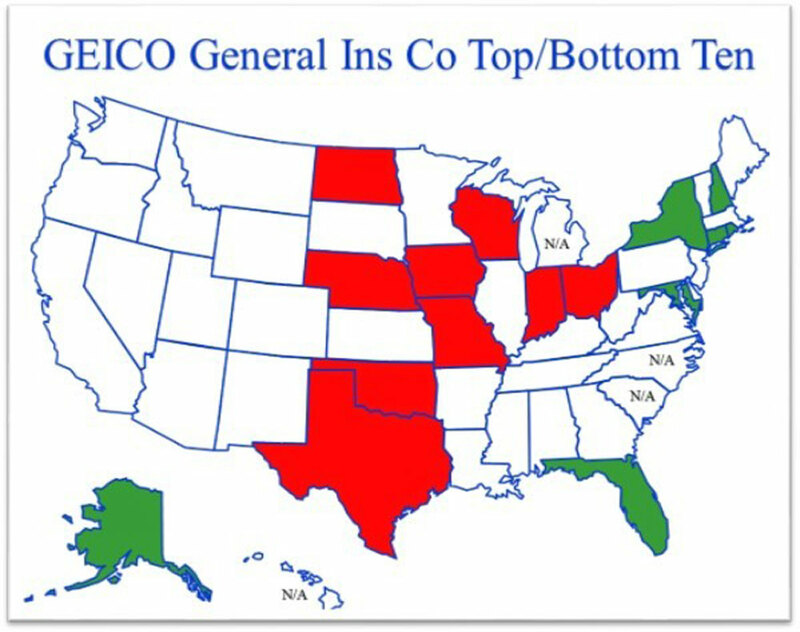 Below is a map of GEICO General's Top and Bottom ten states as measured by standardized, per capita premiums. Since you can't see Washington DC on the map, I provided a table of the top five states which includes DC. If you want all the states, just email me and I'll send you the worksheet. Last week we reviewed a rate filing for Mount Vernon Fire Insurance Company. Thank you for your emails and comments. Below is the ranking from what are rated highest, medium and lower risk "celebrities" in the filing. The higher risk in the list from last week is in Red and the lowest risk is in Green. US Congressman and State Attorneys General without National Face recognition Best Selling authors with National Name recognition Any professional sports figure participating in NBA (unless in rookie year), Championship Professional Boxers, and Professional Wrestlers. Division 1 College Football and College Basketball Head Coaches with NCAA appearances Owners of Professional Sports Teams with National Face recognition Professional athletes in the NFL making more than the team’s median salary (unless in rookie year). Or who are instantly recognizable Any professional sports figure and/or coach participating in the following: Any athlete in the NHL or MLB listed in the Top 25 of the highest paid in that sport. Professional athletes in the NFL making less than the team’s median salary (unless in rookie year). Congratulations to our agent in Pennsylvania on a store pac sale of $9,860 in premium!